Most of the tavernas and restaurants are at the harbourside. Fiskardo (often referred to as Fiscardo) is the northernmost town on the island of Kefalonia. This dreamy, quaint fishing village was the only place on the whole of the island to escape relatively unscathed from the 1953 earthquake. As a result, Fiskardo retains much of it's original charm. Venetian architecture is much in evidence around the picturesque harbour and it is here that village life centres, with most of the restaurants, tavernas and shops facing the sea. Fiskardo lies about 50 kilometres away from Argostoli and can be accessed via the coastal road. The journey takes approximately 1½ hours by car. Fiskardo boasts a hotel, private villas to rent (many with private pools), as well as apartments and rooms to let. There are several private shops set around the harbour selling a wide selection of goods. These range from the typical tourist fare, to more sophisticated merchandise. There are also several mini-markets and a post office. There is a ruined castle near to the village centre, which makes for an interesting visit. 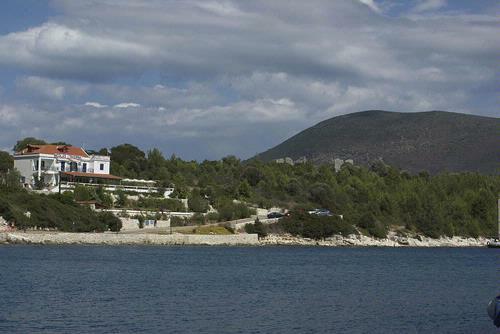 Also, many people choose to take a day trip by boat across to the neighbouring island of Ithaka. 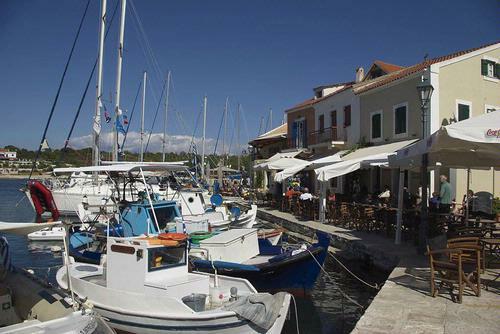 A taverna in Fiskardo overlooking the marina. The castle ruin is nearby. Numerous yachts, motor boats and cruises pay a visit to Fiskardo filling the marina during the peak holiday season, creating a charming spectacle. For watersports enthusiasts, there is a hire shop in Fiskardo where snorkeling equipment is available.